I always have a habit of assuming that everyone is using the same software that I'm using and not until recently did I realize that I'm usually wrong. For example, I assume that everyone is using WinRAR to zip or unzip their files. When I did a Google search for "windows compression software", WinRAR is no where on the first page. Does it mean that it's a bad software? I don't think so. WinZip ranks number 1 on the search results page and I hate it. The reason? Simple, they were trying to force me to buy their software. If I didn't do it, I've to wait longer and longer to unzip a file. I just don't think anyone should pay for some software to zip/unzip their files. Although WinRAR is commercial software, it still gives me all the features I need (and possibly all the features you need too) without forcing me to pay a dime. Just select Extract Here or Extract to <folder_name>. 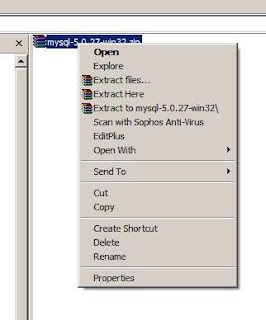 Don't select Extract files..., since you probably don't need to bring up the application interface unless you need to do some advanced stuff. 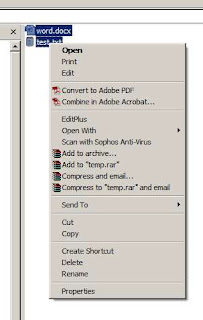 Note that <folder_name> is the name of your ZIP file with the extension ".zip" removed. From this windows, you can choose the name of the zip file in Archive name and change the Archive format from RAR to ZIP (which is the format you'll use most likely). Note that the suggested archive name is the name of the folder containing the files you've selected, which is "temp" in this case. If you like, you can also change the Compressions method, but I usually just leave it as "Normal".